Right well you asked for it, and my poor soggy vegetable garden continues to resemble a rice paddy more than anything I could actually imagine digging, so now’s the time for a spot of virtual gardening instead as I consider what went well, what went badly, and what’s going to be on the seed order for next year. I think the first lesson is that I planted WAY too many potatoes this year. When I’d harvested the maincrops, I sorted out the damaged ones to eat ‘immediately’ while the rest got stored in the shed – and we’re still eating the damaged ones (now going a bit sprouty). We really don’t eat that many potatoes. On the plus side, they keep better than expected and I’ve managed to donate some to neigbours and family. 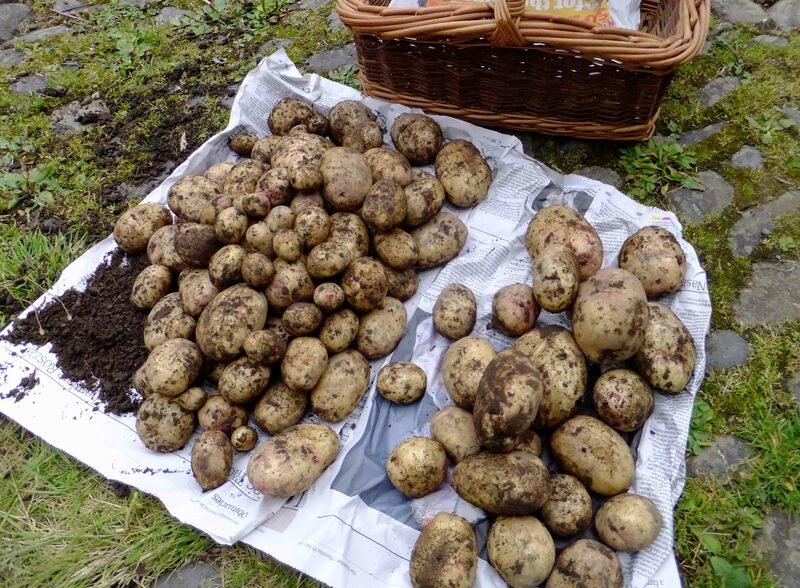 Even so, I think I’ll be scaling back on the tatties next time round. That said, potatoes – along with red and normal onions – were about the only thing that really did that well this year. Suddenly the Scottish diet makes a lot of sense: it consists of things that will grow even if it rains solidly for about 9/10 of the year. Nobody moves to South West Scotland for its mediterranean climate but even so, the weather this year has been spectacularly damp and miserable, even in May when we traditionally have our summer. Anything that required pollination wasn’t happy as a result. The broad beans and peas grew fine but we got way less of a crop than we’ve been used to. And the french beans? Well, the french beans got planted out the day before the huge gale and never really recovered. Although I planted more, it was always a game of catchup and they barely flowered, let alone provided any beans. 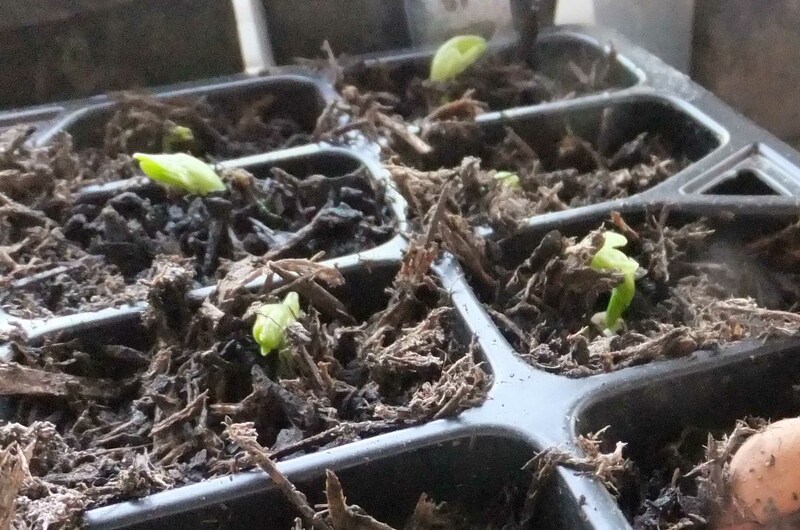 Still, they fared better than a friend’s runner beans – he planted them out on the morning of the gale when they had two nice big true leaves each, sticking out on either side like little wings … I think you can guess the rest. 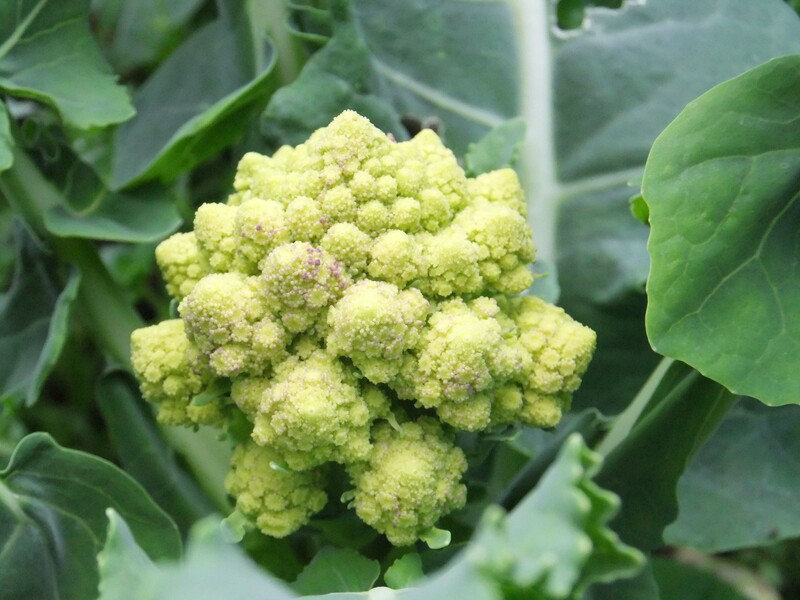 Without much in the way of flying insects about, at least my brassicas didn’t suffer so much from the cabbage whites, which was good for the romanesco at least. Here endeth the good news. The purple sprouting broccoli, which are supposed to overwinter and then sprout in the spring, unsurprisingly mistook the summer for the winter and flowered early. The cabbages were simply remorselessly munched by the slugs (as were the squash) and anything left just bolted. I still have five broccoli plants left which will hopefully sprout again in spring. The pumpkins flowered and then all the little fruits just rotted on the vine. The sweetcorn flowered and then promptly blew over (you’d think a wind-pollinated plant would be a bit more resistant to a bit of wind, but no). Did I mention at all that it was a bit damp and breezy this year? One thing I’ve not suffered from this year at least is monster parsnips, for which I can’t blame the weather (for once) as it was because I completely failed to thin them out so we have a mixture of normal sized and completely weedy parsnips. In fact, if I’m honest, many of my gardening woes have been as much to do with user error than the weather and the slugs. I always, always, always plant everything too soon and then have lots of leggy desperate seedlings on every windowsill. I never stay on top of the weeding or the slug patrols, and I always plant things too close and then can’t bear to thin out the babies. 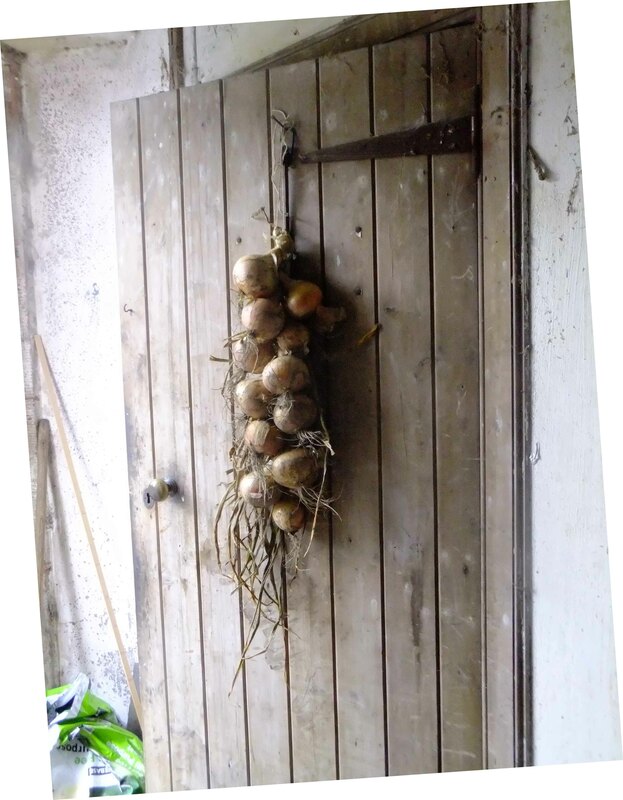 I have never got the hang of soil nutrition and end up with multi-storey garlic (we ate it anyway). I get the veg I deserve, frankly. I shan’t quite be giving up though. I work on the principle that I have to fail three times before I completely give up on any crop. With persistence, I managed to grow some carrots, although I really can’t honestly hand on heart say that it was worth the effort. I also managed to learn to like beetroot, although not as efficiently and quickly as the garden mice did. They basically demolished the entire second sowing and I suspect they’ll be quicker to get to them now they know what they are. Short of shooing the cat off the sofa and up to the walled garden, which is easier said than done these days, I’m not sure exactly how to tackle that problem. I also got third-time lucky with my leeks. 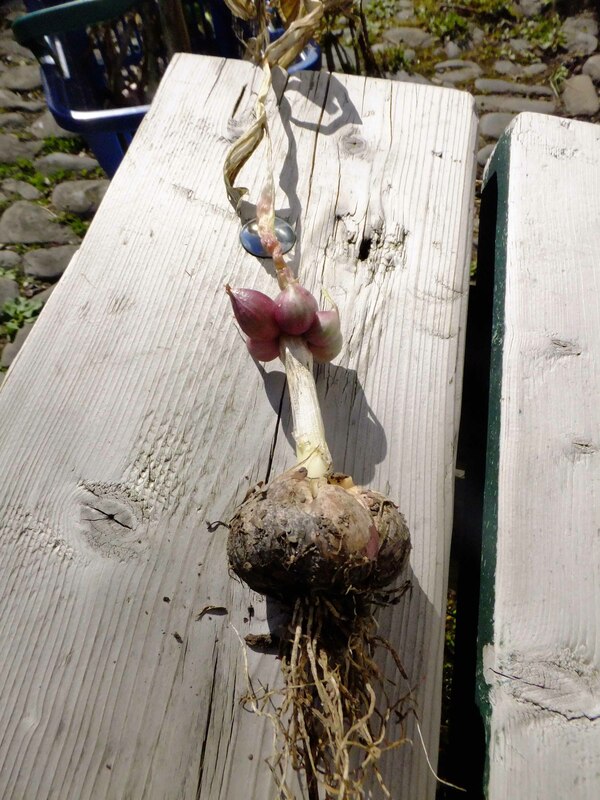 After a first year in which I grew a single solitary (but delicious) leek, and a second year in which I grew rather more, and equally delicious but tiny leeks, this year I have actually grown a fair number of reasonably sized leeks. In fact, rather a lot of them. I planted out a full bed’s worth of little ones and then, as each crop either got harvested or turned up its toes, I transplanted some of the little ones into the space that was left. I now have basically four beds of leeks dotted around the garden (which makes digging it over a little complicated). We’re getting rid of them slowly but surely though. 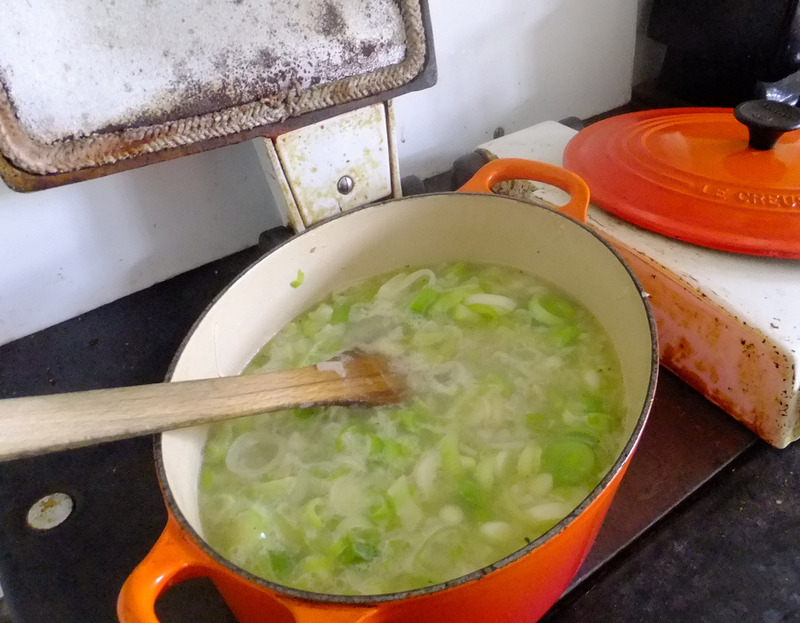 I’m chalking up ‘too many leeks’ under ‘nice problem to have’. The surprise success of the year has been perpetual spinach (or leaf beet) which seems to substitute fine for real spinach, although Jane Grigson, she who knows everything about vegetables, is a bit sniffy about the stuff. It grows, that’s the main thing. I tried real spinach and got about one plant. Our landlord plants it as well and then doesn’t eat it as much as we do so we’ve been supplementing ours with theirs with some success. 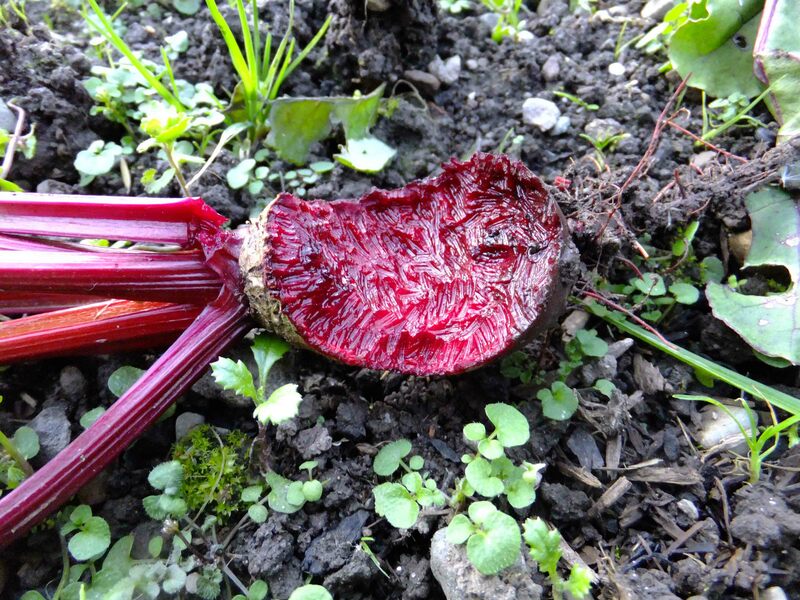 In fact it’s been so remarkably unremarkable and reliabe, I don’t seem to have taken any photos of it or blogged about it or did anything but grow it and eat it. I suppose that counts as a win, in my garden. It’ll have to because without a spreadsheet any more I have no other way of keeping score. In the long march between Christmas and New Year, all up and down the land there are too many people stuffed into too-small houses, eating up all the too much food they prepared for the big day. Under these circumstances, getting out for some fresh air becomes imperative, and as a walk is always better when it has a purpose, what better purpose can there be than to go up to the local duck pond and feed the ducks? Duns’s particular duck pond is the Hen Poo in the castle grounds, and there appears to be a constant procession of family groups heading up there to shiver in the wind and donate some of the surplus grub to the birds. At the sight of a likely looking group – or even a lone blogger with a camera who forgot her bread – they come sprinting as fast as a duck can sprint. They surely know in their little duck hearts that this is not going to be good for them, that they don’t need it, that they’ll pay for it in the long run … and yet still they come. Strangely enough, a similar effect can be achieved in our household by asking if anyone’s got room for another mince pie. … can I come with you? Much as I’d like to think that this reflected her intelligence in realising we were leaving, and her desire to come along, I suspect it’s got more to do with the general cat compulsion to get inside anything that she has previously been unable to get into to try it for size. 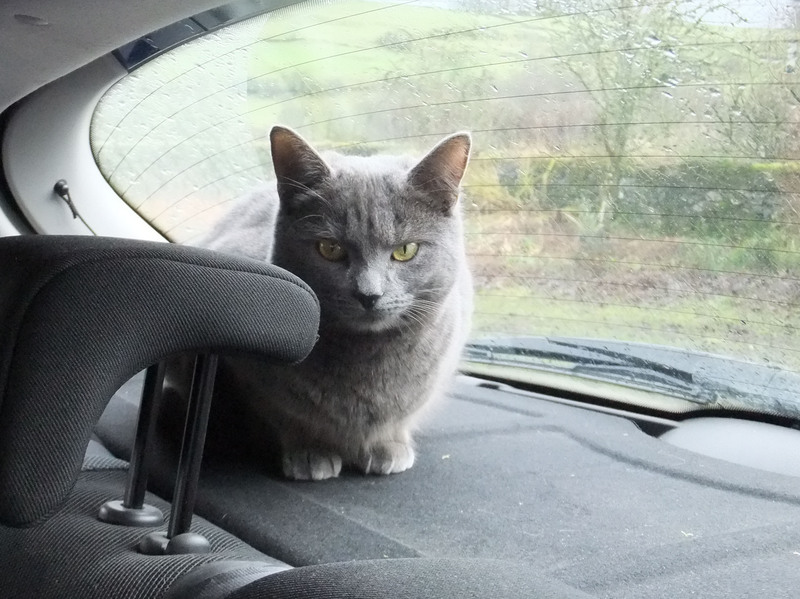 No doubt if we’d been trying to get her into the car with us, it would have been a lot more of a battle. Be that as it may, wherever you are this Christmas and whoever you’re with, I hope you have a good one. oh, and in case anyone is worrying, the landlord is looking after the cat. Tomorrow we head off for Duns, letting the stove go out fully for the first time in almost three weeks (an act that feels a bit like extinguishing the Olympic flame). And it being Christmas I had a few errands to run today, seeing as it’s the season for nipping out to the shops for the millionth time for the thing you forgot the last time you nipped out to the shops. Naturally, these errands were in diametrically opposite directions to each other which meant that this afternoon I suddenly had a total of 23 miles to cover on the bike (home to Papershop Village, Papershop Village to Bigtown, Bigtown to home). Astoundingly, given that the forecast had been for a mild, dry but overcast, breezy day, the afternoon turned out to be mild, dry but overcast and a bit breezy, so I set off, pedalling as only a cyclist who has been barely able to cycle for weeks and will be unable to cycle for another week can pedal. In truth, it was more of a bike ride with a few errands thrown in than nipping out to run errands on the bike, but who cares. The weather’s been all over the place this year, with May coming in April, March repeating itself throughout the summer, and September turning out like November. If the shortest day of the year wanted to suddenly turn in an impression of early October, I wasn’t going to argue with it. It will be a while before I’m back on the bike, scattering flocks of chaffinches, sending sheep running, and slowing down while squirrel Nutkin makes up his fluffy mind which side of the road he wishes to be on, so I enjoyed it while I could. Updates may be a little sporadic over the next few days as we will be attempting to beat the world record for the greatest number of family members crammed into a tiny house over at Huttonian‘s. However, I do want to flag up this. The Womens’ Institute, Gawd bless its jam-making, Jerusalem-singing and Tony-Blair-slow-handclapping cotton socks wishes to encourage cycling. Sadly, it’s considering doing so by making cycling helmets compulsory. If that strikes you as a bit daft, or even if it doesn’t, I’d urge you to read this and then go and sign this. Hopefully, once sense has been seen and the might of the WI is brought to bear instead on the real issues of cyclists’ safety, such as decent bike paths, Jerusalem really will be builded here and it really will be a green and pleasant land. If this continues, I may come back from one of my trips to London to find the locks changed – and a cat flap installed in the front door. Excitement reigns in the Townmouse household with the news that Doctor’s Village is about to regain its village pub! According to the local paper, the community run shop initiative has failed so they decided to turn the premises into a pub instead, the former pub having long been turned into a private home. This is definitely swimming against the tide because if there’s been one real disappointment about rural life in these parts it’s been the lack of decent pubs. No self-respecting English village would consider itself complete without a pub, long after the shop, school, bus stop, phone box and even bench have disappeared, but Scottish pubs don’t seem to be quite the centre of rural life in the way English ones are and unless they’re on Big A Road, they struggle to survive. It’s a shame because having a local pub to head for adds almost as much pleasure to a bike ride as having a decent cafe, another thing we’re sadly lacking in round here now I come to think of it. So we wish the new venture well and look forward to checking out our almost local boozer, although I suspect it won’t be for a while yet. Doctor’s Village is technically closer to us than Papershop village but the reason why I didn’t get my paper there when there was a shop is that it’s at the very top of a particularly steep and endless hill which makes going to the doctor quite interesting (I’ve learned to arrive a good 15 minutes before my appointments if I’m going by bike to get my blood pressure back down to a normal range). Good for working up a thirst – and great for getting swiftly home – but maybe not in the pitch dark on a dodgy potholed road. If you’ve drunk enough to think that that’s a good idea, then you’re probably too drunk to be on a bike at all. We’ll save that one for the long summer evenings, I think. Always assuming the pub’s still going by then. This month we’re in sole charge of the cat, as the neighbour has gone off to Australia and New Zealand, the lucky sod. It isn’t too much of a chore – just a matter of feeding her twice a day and then standing at the neighbour’s front door while she performs whatever complex calculation it is that determines whether a cat wants to be inside or outside at that moment in time. These days she normally opts to spend the day asleep indoors and the night out murdering things but last night, at about ten o’clock, we heard a pitiful miaowing and opened the door to the cat, looking extremely bedraggled and wet, the weather having turned for the worse. Well, we’re soft hearted so we let her in, left her in charge of the fire and went to bed. Of course, a line must be drawn and standards must be kept up and we can’t tolerate having a dumb animal, however cute, waking us up at all hours, without so much as bringing us a cup of coffee to soften the blow. So I’m going to be firm about the cat staying outdoors at night or at the very least being banished to the far end of the house. Or if she comes into the sitting room she has to stay out of the bedroom. Or our bed. Or the head end of the bed at least. Or if she comes to the head end she has to be quiet and no miaowing. Or at least, no miaowing before 7am. Or no miaowing before 7am IN MY EAR. *What? Stop looking at me like that – she has a fur coat on and plenty of sheds to shelter in. You are currently browsing the Town Mouse blog archives for December, 2011.